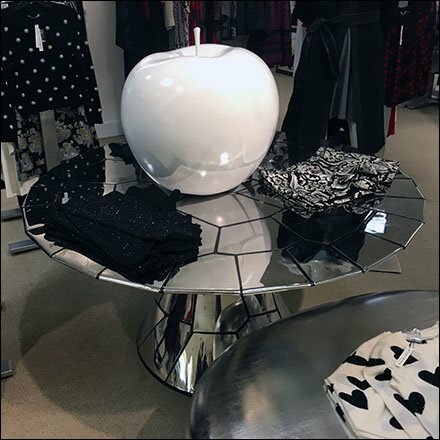 White apple atop mirrored table would be eye-catching any season at Saks® but here was pictured as part of Winter Visual Merchandising. Note in particular the tiled effect of the mirrored table. This was a one-up visual creation, in that I did not see any nearby parallel approaches. Click the thumbnail for a closeup of the apple. Do you think you’d ever paint it red for an Adam and Eve, Garden of Eden display?